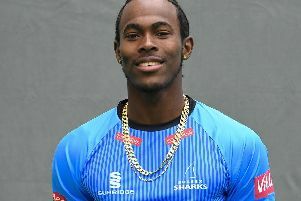 Rashid Khan has praised the performance of team-mate Michael Burgess as the Sussex wicketkeeper settles into one of the toughest challenges facing any player during this season’s Vitality Blast. Khan, the ICC world ranked No.1 T20 bowler, has made a predictably strong start to his Sussex career, with four wickets and an economy rate of just 6.50 in their opening two wins over Essex and Glamorgan. And he reckons Burgess has made a pretty good start too in trying to keep to the mercurial Khan, who bowls his mix of leg-breaks, arm balls and googlies at such a remarkable speed. “I only arrived last Monday and we had one net session on Tuesday but he’s picked it up pretty fast – he’s been amazing really,” said the 19-year-old. “It is quite difficult, but we have done some good sessions in the nets in the last few days between matches and we talk a lot during the games. Burgess only keeps for Sussex in the T20 and trying to pick the variations of one of the best spinners in the world represents a fascinating challenge for a player who is also expected to make important middle-order runs as well. After starting with two wins, one of the pre-tournament favourites will be hoping for more of the same this week when they go to the Ageas Bowl to face Hampshire on Thursday before entertaining Surrey at a sold-out 1st Central County Ground in Hove on Friday. For Rashid it offers more opportunity to test himself on unfamiliar grounds and surfaces a lot different to those back in his native Afghanistan and around Asia where he has played most of his cricket so far. Sussex have the luxury of being able to call on Chris Jordan after he missed their first two Blast games whilst on England duty and it will be interesting to see where Head Coach Jason Gillespie accommodates him if he decides to change a winning team.